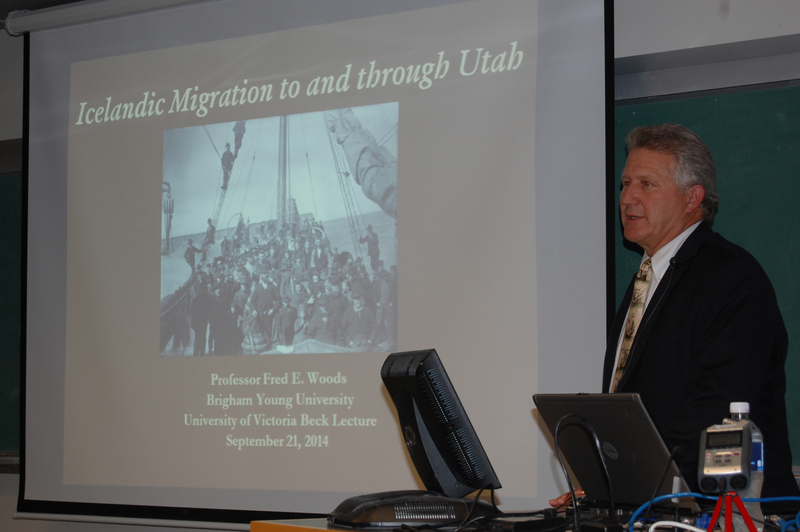 When I was at the INL convention in Seattle, I heard Prof. Fred E. Woods give a talk on the emigration of Icelanders to Utah in the 1800s. I was fascinated because I had read Laxness’s novel Paradise Reclaimed in which an Icelandic farmer starts out on a journey to Denmark but ends up in Utah. He then returns to his farm in Iceland only to find it in ruins. In his talk for the Richard and Margret Beck Trust on September 21st, Prof. Woods said people know about Steinar of Hlidar and his journey but they don’t know about the people who went to Utah and remained. It is Prof. Woods plan to collect all the information possible about the people who stayed and to that end he has been gathering letters, diaries, photographs, articles both in North America and in Iceland. In Utah, he has been borrowing material, copying it and returning it to the owners. His photographs showed what were family treasure troves. He emphasized that Mormon culture encouraged the keeping of diaries. Mormon beliefs included the idea that everyone in the human race was connected, that family was the primary building block of society and, so, the keeping of family histories has been encouraged. In Iceland, he is working with Kári Bjarnason, director of the library in Vestmannaeyjar. The connection is important because more than half of the emigrants came from Vestmannaeyar. Dr. Woods became interested in the migration of Icelandic Mormons in 1999. Although he has no Icelandic background, he began to work with the Icelandic Association of Utah. In emigration there are always push pull factors. For example, emigration from Iceland to North America was nearly impossible because there was no regular transport to England and Scotland which, in turn, would allow emigrants to board ships for North America. Sailing ships only came to Iceland from Denmark during the summer months. The difficulty of reaching North America was such that it was surprising that as many took a chance on emigrating as they did. At the same time, conditions in Iceland, always harsh, had been deteriorating with cold weather, volcanic eruptions and no opportunities since Iceland was still rural and the small amount of grazing land was owned by wealthier farmers or by the church. Prof. Woods, in his lecture, emphasized the pull factor in the appearance of Mormon converts who spread both knowledge of and belief in the Mormon faith. As with all religious movements, this one had to start with someone who was converted and who returned to spread the word of both religion and opportunity. That one person, Gudmunder Gudmundsson had moved to Denmark to become a goldsmith. He and a childhood friend who was in Denmark, Þórarinn Hafliðason, became the first Mormon missionaries to proselytize in Iceland. Prof. Wood mentioned, a number of times, how through his research he’s been able to document the truth of the early missionary’s accounts of their experience in Iceland. They were met with a great deal of hostility which isn’t surprising. Iceland’s state religion was Lutheranism. Rooted in Catholicism and, before that, paganism, in which religious and secular power were inextricably linked, the preaching of a new religion with new loyalties and ideas—Luther wanted to graft new branches on the church tree; Mormonism thought the tree dead and wanted to grow a new one—threatened the age-old order. Also, Iceland was a homogeneous country with a tiny population so that new lines of authority were a threat in a way that they wouldn’t be in a country with a large population. Part of Mormon tradition is the persecution of its proselytizers. Evidence of such persecution is dramatized in Paradise Reclaimed. The Mormon bishop is treated badly. Icelandic documents confirm officialdom was hostile. In spite of that hostility and the tremendous difficulty of travel, a few people emigrated anyway. From the material Prof. Woods presented, I would be inclined to believe that the small number of people who left for Utah in spite of local conditions in Iceland was the result of a variety of conditions. In the 1850s, little was known of America, the beliefs preached by the Mormons was very different from Icelandic Lutheranism, and Iceland’s small population shared a history and culture built on personal family ties. By the 1870s, when conditions had deteriorated even more, the migration of twenty percent of the population for economic reasons to North America also was met with tremendous hostility by those who stayed behind. That hostility didn’t stop people from emigrating. However, the push effect had become much greater as economic conditions had deteriorated and the pull factor had become greater with the possibility of taking ships to England and Scotland and from there to Quebec. I welcome and applaud Prof. Woods research and publications about these “lost” Icelanders. Because he is making his materials available on the internet, knowledge about this part of our history is now available. Prof. Woods material can be accessed at http://rsc.byu.edu/archived/fire-ice-story-icelandic-latter-day-saints-home-and-abroad/appendix-icelandic-immigrants. Or you can simply Google Icelandic immigration Utah. Prof. Woods is an entertaining and informative lecturer. His talk was well attended. This entry was posted in Uncategorized and tagged 1850s, Fred Woods, Gudmunder Gudmundsson, Iceland, Icelandic Association of Utah, Kari Bjarnason, Laxness, Mormon emigration, Paradise Regained, Salt Lake City, Utah, Vstmannaeyjar by william. Bookmark the permalink. Enjoyed this post. I just returned from Iceland, along with 10 or so relatives all descended from Petur Valgarðsson. We were on Vestmannaeyjar the end of August and were fortunate enough to hear from Professor Woods and Kari Bjarnason about the Mormon Icelander immigration to include highlights on Petur and his wives. It was an amazing experience! I wonder if we are related? Me and most of my immediate family are from UT. Some 2nd cousins of my dad live in Canada. Would be great to connect with you! I can be reached at lvalgardson@gmail.